Scheme 7 Synthesis of N-linked glycopeptides on a solid support. o based reactive species (donor). While the glycal assembly method, which utilizes a support-bound reactive species, has been used very successfully for the synthesis of oligosaccharides and glycopeptides, all other synthetic approaches explored to date have followed an acceptor-bound strategy. The acceptor-bound paradigm allows for the glycosyl donor to be used in excess during elongation of the growing oligosac-charide from the reducing to the nonreducing end. Because the donor is used in excess, side reactions that usually affect the glycosyl donor, resulting in inactive degradation products, do not impact the overall yield. Each hydroxyl group to serve as a glycosyl acceptor needs to be distinguished by a unique protecting group, which may be removed before each coupling cycle. In this section synthetic strategies employing a variety of glycosylating agents are reviewed. The use of anomeric sulfoxides as glycosylating reagents was reported by Kahne and coworkers in 1989 . Upon activation with triflic anhydride at low temperatures, anomeric sulfoxides are transformed into extremely reactive glycosyl donors, which can glycosylate very hindered acceptors. The excellent reactivity of the sulf-oxide donors coupled with the selectivity achieved by use of a participating group in the C2 position prompted their use in the synthesis of oligosaccharides on the solid support . Merrifield's resin (polystyrene cross-linked with 1% divinylbenzene) was chosen as a polymer matrix, and an anomeric hydroxy thiophenyl ether moiety was selected as linker to the solid support (Scheme 8). The thiophenyl linkage is stable to all coupling and deprotection conditions but may be cleaved readily with mercuric trifluoroacetate. The first monosaccharide 42 was selectively deprotected and coupled by addition of 4 equiv of galactosyl sulfoxide 44, in the presence of DTBP as a base, and triflic anhydride as activator. Coupling at — 60°C for 30 min, filtration, and washing were followed by deprotection of the acetyl group. One further coupling and cleavage from the polymeric support by reaction with mercuric trifluoride furnished trisaccharide 50 in 52% overall yield. It was estimated that each coupling proceeded in 94-95% yield based on a detachment efficiency of 70-75% (as determined by solution phase studies). The glycosyl sulfoxide strategy successfully accommodated secondary hydroxyl acceptor groups, and a-fucosidic linkages were generated by the use of fucosyl sulfoxides . These advances in the solid support synthesis of oligosaccharides using gly-cosyl sulfoxides were applied to the preparation of a combinatorial library of approximately 1300 disaccharides and trisaccharides . A polystyrene-polyethylene glycol (PS-PEG) copolymer that swells in a wide range of solvents, including water, was employed in the syntheis of these libraries. Screening of the carbohydrate structures against a bacterial lectin from Bauthinia purpurea was performed with the carbohydrate structures still attached to the resin beads. Use of a chemical tagging system developed by Still and coworkers  allowed for rapid structure determination of the hits in the screening assay. Alternate binding structures with higher affinity than the natural ligand for the lectin of interest were identified in this manner. Scheme 8 Solid phase synthesis of a trisaccharide by the glycosyl sulfoxide method. of natural and nonnatural lectin ligands. While the synthesis of larger oligosaccharide structures using the glycosyl sulfoxide method still needs to be demonstrated, this strategy holds great potential for many applications. Among the multitude of glycosylating agents now at the disposal of the synthetic chemist, glycosyl trichloroacetimidates have become the most widely used building blocks. These donors have been used to prepare a large number of very complex oligosaccharides and glycoconjugates in solution phase . High coupling yield, versatility, and excellent selectivity are hallmarks of this approach to oligosaccharide synthesis. Recently the first syntheses of oligosaccharides using trichloroacetimidate donors on the solid support have been reported. Schmidt and coworkers initially used Merrifield's resin and explored a variety of ether and thioether linkers . Attach ment of the first residue via a thioether linkage proved most reliable, and cleavage was successfully effected by reaction with a nucleophile. Reaction with water or methanol in the presene of V-bromosuccinimide yielded the lactol or the methyl glycoside, respectively. A two-step coupling cycle (Scheme 9) was used to assemble a series of (1—>2) linked mannosides. 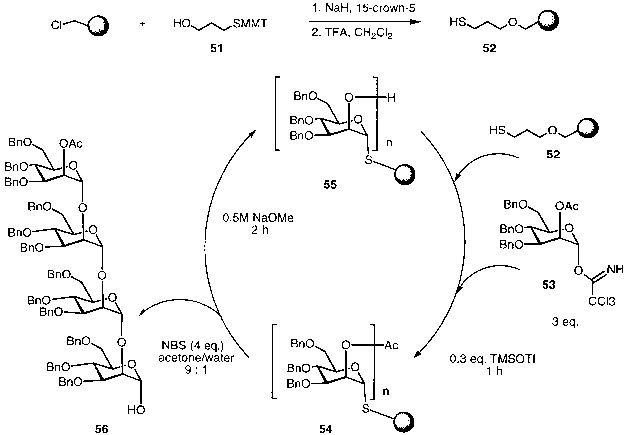 Removal of the temporary acetyl-protecting group by sodium methoxide in methanol was followed by coupling of the trichloroacetimidate man-nosyl donor 53 to the exposed axial C2 hydroxyl group. Repetition of this cycle and cleavage of the thioether linker resulted in assembly of the desired tetrasaccharide 56 in 34% overall yield. Penta- and hexamannosides obtained by using this method were characterized by mass spectrometry, but no yields were reported . In addition to 1,2-trans-glycosides, disaccharides containing the synthetically more challenging 1,2-ds-glycosidic linkage were prepared. Fucosyl trichloroacetim-idate was coupled to the C2 position of a support-bound mannosyl acceptor under the agency of trimethylsilyl triflate (TMSOTf) to yield 54% of the desired disaccha-ride . Promising results were also obtained for the synthesis of a (1—2) triman-noside, which was prepared on a mercaptoethyl-functionalized controlled pore glass (CPG) solid support. This nonswelling support performed well under the described coupling and deprotection conditions . More recently, the trichloroacetimidate strategy has been applied to the synthesis of a branched pentasaccharide unit common to most complex V-glycan structures (Scheme 10). Reaction of mannosyl donor 57 with thiol-functionalized resin resulted in attachment to the polymer matrix through the reducing end of the sugar 58. Removal of the benzoyl protecting groups on the C3 and C6 positions was effected by treatment with sodium methoxide to furnish diol 59. Dimannosylation was accomplished by reaction with trichloroacetimidate mannosyl donor 53 to afford solid support bound trisaccharide 60 in 38% overall yield. Cleavage of the acetyl protecting groups of the axial C2 hydroxyl functionalities revealed support-bound trisaccharide diol 61. Conversion of 61 to pentasaccharide 63 was achieved by reaction with glucosamine donor 62. Cleavage of the thioether linker with V-bromo-succinimide in the presence of methanol furnished the desired pentasaccharide methyl glycoside in 20% overall yield. 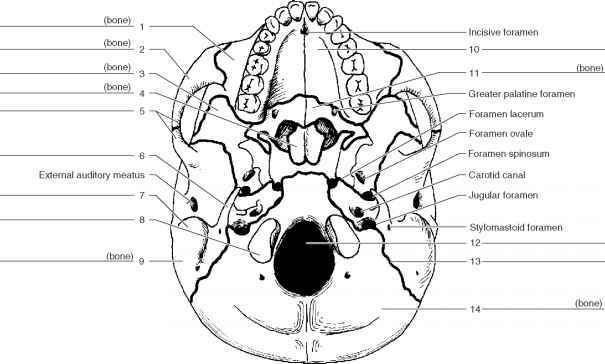 Adinolfi et al. explored the use of different solid supports for the synthesis of disaccharides employing trichloroacetimidate donors. The glycosyl acceptor was connected through the C2, C3, or C6 hydroxyl group to amino-functionalized solid support via a succinimide linker. Polystyrene, PS-PEG copolymer (TentaGel), and CPG supports were tested for their performance with trichloroacetimidate donors. Best coupling yields (95%) were obtained in these studies when the donor was reacted with acceptor bound to CPG or polystyrene support. PEG-containing co-polymers performed significantly poorer in these glycosylations. Hunt and Roush  used a solid phase method to prepare 6-deoxy di- and trisaccharides. A sulfonate linker was employed to connect the first monosaccharide, a glycal, via its C6 position to the polymer resin. A galactosyl trichloroacetimidate donor was used in the first coupling reaction, followed by cleavage from the solid support by treatment with Nal to furnish pure disaccharides in 85-91% yield. Reduction with Bu3SnH (AIBN) provided the desired 6-deoxydisaccharide. Scheme 9 Synthesis of a (1^2) mannosides by the trichloroacetimidate strategy. Scheme 10 Use of trichloroacetimidate donors in the preparation of a branched pentasaccharide. 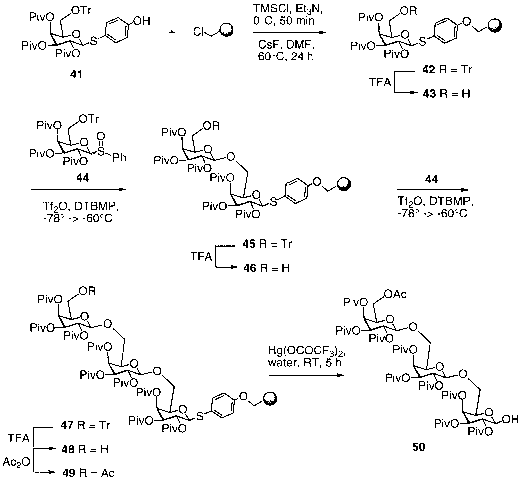 synthesis of complex oligosaccharide structures containing a variety of glycosidic linkages. Before the assembly of larger constructs may be contemplated, the overall yield and recovery will have to be improved. Novel linkers that are completely stable throughout the synthesis as well as improved coupling protocols should remedy these shortcomings. 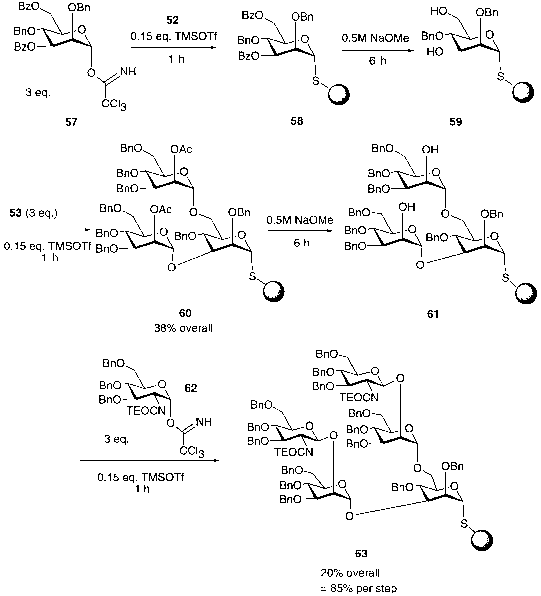 Next to anomeric trichloroacetimidates, thioglycosides are the glycosyl donors most widely used in the synthesis of complex oligosaccharides and glycoconjugats. Thio-glycosides may be prepared in high yield and are exceptionally stable, allowing for prolonged storage even at room temperature. Reaction with thiophiles such as methyl triflate or dimethylthiomethylsulfonium triflate (DMTST) ensures efficient activation of thioglycosides for the formation of glycosidic linkages . In solution phase, thioethyl glycosides have found application in the synthesis of very complex oli-gosaccharides and in the preparation of a combinatorial carbohydrate library . Straightforward synthetic access, stability, and high-yielding, selective glyco-sylation reactions made thioglycoside donors ideal for application to the solid support synthesis of oligosaccharides. 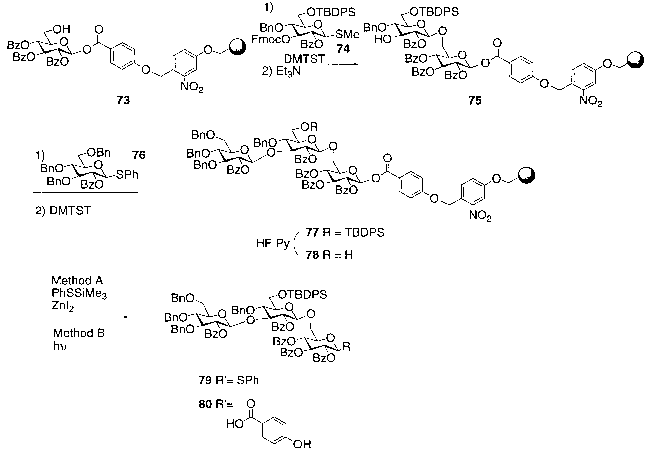 Nicolaou and coworkers utilized phenolic polystyrene equipped with a photolabile, readily available o-nitrobenzyl linker in the synthesis of heptasaccharide 72 from mycelial walls of Phytophthora megasperma (Scheme 11) . This heptasaccharide consists entirely of /3 (1^6) or (1^3) glucosidic linkages and had previously been prepared by using solution phase methods  and block synthesis on a soluble PEG polymer . Silyl ethers and fluorenylmethyl-oxy carbonyl (Fmoc) protective groups were employed to provide temporary protection of the hydroxyl functionalities to be glycosylated in the coupling steps that followed. Removal of the silyl ether protecting group by fluoridolysis to yield 64 was followed by coupling of 4 equiv of the solution-bound thiodonor 65 in the presence of the activator DMTST. The coupling to form 66 proceeded in greater than 95% yield according to material recovered after cleavage from the resin. Consecutive deprotection and coupling steps resulted in assembly of the desired hepta-saccharide 71 still attached to the polymeric support. Photolytic cleavage of the linker, treatment with sodium methoxide to remove the ester protecting groups, and hydrogenolysis to cleave the benzyl ethers yielded unprotected heptasaccharide 72. 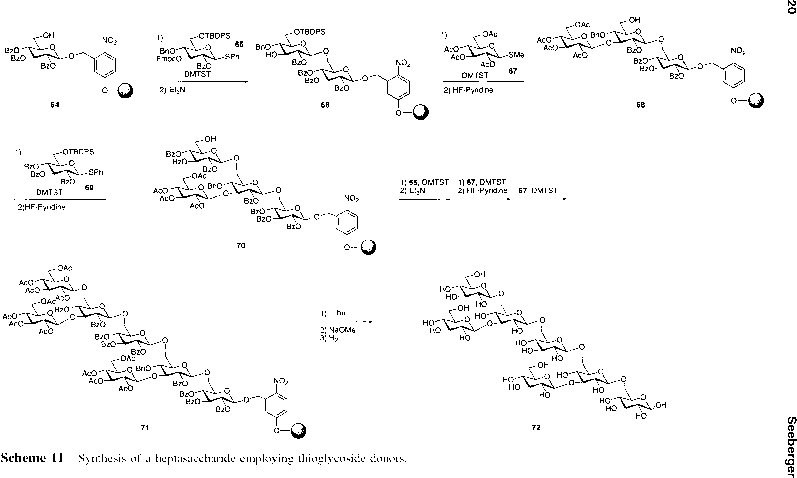 Alternatively, fully protected heptasaccharide was obtained by acetylation of the anomeric hydroxyl group support in 20% overall yield from 64 after photolytic cleavage from the solid support . After having established a reliable and efficient reaction sequence for the synthesis of oligosaccharides Nicolaou et al. further improved upon their initial strategy . A 4-benzyloxybenzoic acid spacer was incorporated between the photolabile linker and the anomeric position of the first glycoside to provide access to either unprotected oligosaccharides or oligosaccharide glycosyl donors (Scheme 12). Support-bound acceptor 73 was converted into trisaccharide 77 following the synthetic strategy established earlier (see above). Cleavage from the resin was effected pho-tolytically to furnish the fully protected trisaccharide 80 in 63% yield from 73. Alternatively, the protected trisaccharide was cleaved from the polymer with concomitant activation by exposure to PhSSiMe3/ZnI2/nBu4NI, furnishing phenylthiotri-saccharide donor 79 (Scheme 12; pp. 21 and 22). Support-derived trisaccharide building block 79 was used in a block synthesis of dodecasaccharide 82 (Scheme 13; p. 23). Reaction of support-bound glycosyl acceptor 78 with 79 furnished hexasaccharide 81. Removal of a silyl protecting group and coupling with trisaccharide donor 79 was repeated twice, followed by photolytic cleavage of the linker to furnish dodecasaccharide 82 in 10% yield from 73 . Scheme 12 Preparation of trisaccharide thioglycoside building blocks on a solid support.